WWE and MMA star Brock Lesnar has been called “the Beast Incarnate” and is regarded as one of the toughest men on the planet. He was the one who ended The Undertaker‘s undefeated streak at Wrestlemania, and made a huge return at UFC 200, securing yet another victory on his resume. But now, the 39-year old is under an investigation from the Anti-Doping Agency. 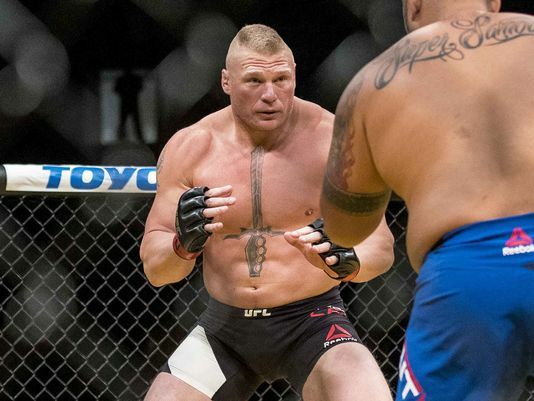 The UFC announced on Friday that the U.S. Anti-Doping Agency has informed Lesnar of a possible doping violation stemming from a sample collected only 12 days before his big UFC 200 victory over Mark Hunt. “The UFC organization was notified today that the U.S. Anti-Doping Agency (USADA) has informed Brock Lesnar of a potential Anti-Doping Policy violation stemming from an out-of-competition sample collection on June 28, 2016,” the company said in a statement. “USADA received the testing results from the June 28, 2016 sample collection from the WADA-accredited UCLA Olympic Analytical Laboratory on the evening of July 14, 2016. Under the UFC’s anti-doping program, which is administered by USADA and went into effect in July 2015, results management and adjudication of the case falls to USADA, as well as the Nevada State Athletic Commission, due to the fact Lesnar’s fight took place in Las Vegas. Bob Bennett, executive officer of the NSAC, told the Los Angeles Times that Lesnar’s purse could be factored in assessing the size of a potential fine. “Exactly, right,” Bennett told the newspaper. In his UFC career, Lesnar has never tested positive for any type of banned substance. Per sources, the UFC is able to grant exemptions to that requirement. Partly due to Lesnar’s contract situation with WWE, the UFC decided to waive that four-month window for the first time ever. It is a very complex situation that is occurring for the veteran athlete, and for the sake of his career, hopefully it will be resolved in a manner that will not involve suspension.